Recently, a friend sent me a note in which she mentioned that “The Giving Tree” is her daughter’s current favorite book. Before reading my friend’s letter, I hadn’t thought of my favorite Shel Silverstein work in a while. Ever since, I’ve been thinking about why I love this story so much. 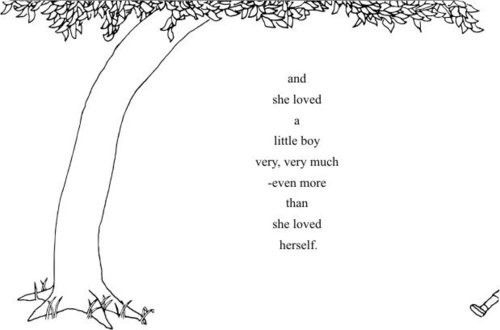 According to Silverstein’s website, this touching story “offers an affecting interpretation of the gift of giving and a serene acceptance of another’s capacity to love in return.” The tree loves the boy without condition, never thinking about what’s in it for her. When it seems there’s nothing left for the tree to offer the boy, still she finds more to give. It is a poignant story, and a beautiful concept. Some people think the tree represents God. I don’t know how I never noticed it before but, to me, the story chronicles the relationship between a mother and her child. Until now, I didn’t think too much about how mothers give their flesh and blood in the most literal sense possible. Just as the tree provides her fruit, her branches and even her trunk, women share every bit of themselves; all with the goal of helping their babies grow strong enough leave and forge their own way in the world. My mother did this for me, and her mother for her and so on. It’s an incredible thing when you stop to think about it. From my earliest visions for the nursery, there’s been one part of the décor that I’ve consistently imagined: a mural climbing up the wall and arching over the crib. Without really knowing why, I always pictured a tree, with or without birds, leaves or fruit, but always forming a protective canopy over where the baby will sleep. It’s only just now occurred to me that I’ve been picturing the Giving Tree all along. I guess my interpretation of motherhood falls somewhere between Silverstein’s and O’Dell’s versions, but doesn’t align perfectly with either. I can’t wait to let this baby swing from my branches and nap in my shade, but I don’t plan to end up a felled stump, happy only when I’m serving my child. Similarly, I know I’ll ferociously protect my baby from the pain in the world, but without teaching him or her to turn a blind eye. I want to be a Giving Tree for this baby and I hope the world will be one too. And yet, I don’t want the world to simply drop apples into his or her outstretched hand. I’d prefer to watch my child climb the world’s highest limbs and learn that the sweetest fruit is sometimes the hardest to reach. Posted in Children, Life, Parenting, Pregnancy and tagged Baby, parenting, the giving tree, unconditional love. Bookmark the permalink. Cortney, thank you for the comment, and thank you for reading! Amazing and poignant as always, and with such appropriate timing. See you in 2 days, my kind, gracious & beautiful friend. Kennedy, I can’t wait to see you! Thank you for the compliment and, as always, just for being you. Jan, you are definitely the expert on such matters! Thank you for the kind words and the life preparation you gave me all those years ago. I hope to raise this baby in the SYC way! Love this post! Your baby is very lucky to have a momma like you.